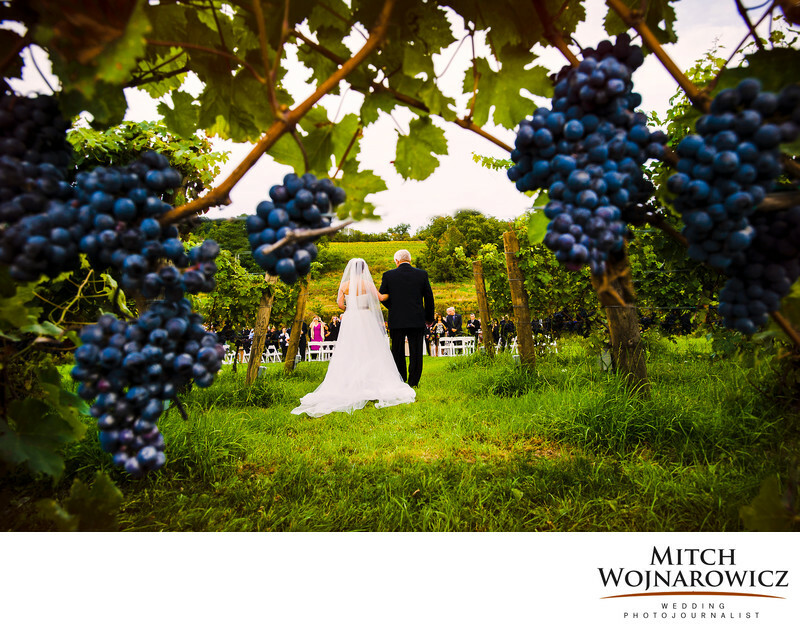 A favorite Millbrook winery wedding photo is this one of Kara the bride and her father walking up the aisle at the Hudson Valley wedding in the fall with the fall grape harvest of award winning Pinot Noir wine grapes surrounding them. There is a photo adjacent to this one of the front of Kara and her father processing up aisle smiling at each other. I shot them both. As a Hudson valley wedding photojournalist, I bring decades of experience to your wedding day. And one of those areas of expertise is what we call remote cameras. I can cover two angles at once by setting up a second remotely controlled camera that I trigger as I’m shooting in a different spot. It takes a lot of planning and experience to make this work. And I’ve been doing it for decades. Talk to an experienced wedding photographer, one who has photographed hundreds and hundreds of weddings. And one such as me who has photographed many other subjects, who brings a diverse skill set to your wedding day.